Sometimes you never know where inspiration will come from. For me, it can come from a song, a child’s toy, or from a random item I find at a thrift store. It’s not something I can force or rush; although I do admit that I try. I just have to open myself up to the possibility and it usually just happens. Last week my coworker Pooja (you remember the fudge I made for her) asked me if I could be interested in making a treat for a little baby shower she was throwing for a new dad on her team. I loved the idea of making something cute and babyish but appropriate for a guy, but I really had no idea what that would be. So after work last Friday, I headed to the grocery store to pick up some vittles for the weekend and wandered over to the baby department. Slowly I pushed my cart between the narrow isles full of toys, bibs, socks, and loads clothing, looking for anything that might spark my creativity. 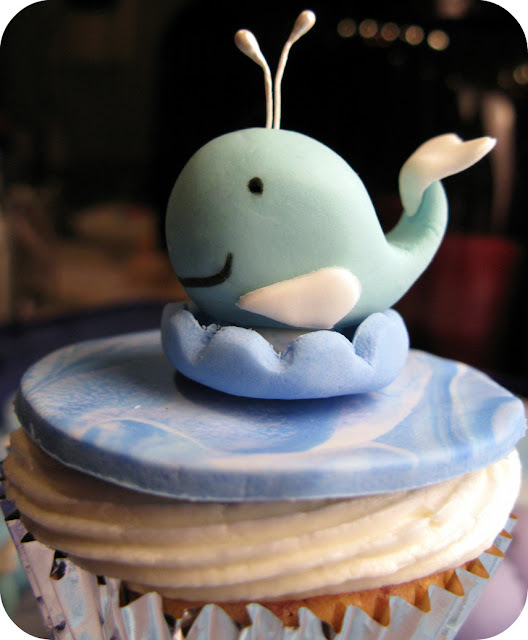 Just when I was about to give up hope, I found my muse: a little whale! I don’t know why, but whales seem very masculine to me and I knew these would work perfectly. As for the cupcake flavor? Well, Pooja was very sly and found out that the new dad’s favorite dessert is strawberry shortcake. Since those wouldn’t hold up to being decorated with little whales, I decided I’d make strawberry cupcakes with vanilla buttercream. And just in case you’re curious how I made these: the whales and star fish are made out of gum paste, the “ocean” disk and little wave pedestals are both made out of marbleized blue and white fondant, and the little splashes of water coming out of the blowhole are made from non-edible flower stamens. 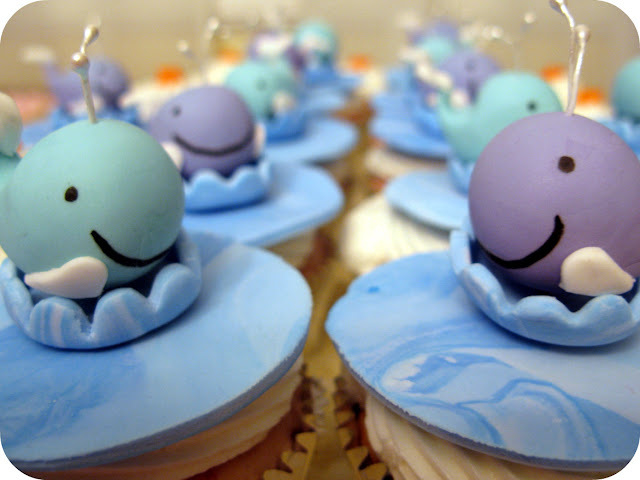 These are some of the cutest cupcakes I've seen:) Lovely idea! Oh my gosh, who could eat those sweet little cupcakes? I love photo 7, where they are all bunched up together! Fabulous job! You always rock 'em out, one right after the other! I love them! I hope you don't mind, I thought they would appreciate them!! Well done! Wow, I'm so glad you found your inspiration. You totally out-did yourself!! These whales are the cutest little guys ever. And I can't wait to see the recipe. I'm sure the new Dad was super impressed by your outrageous culinary skills! Wow! Those are amazing!! Is this your professional job? If not, I think it should be. Those are adorable cupcakes! I wish I was that talented! Those are so darn cute. I think of whales as being masculine, too. Thank you all so much for taking the time to comment -- it means so much to me to hear your feedback! 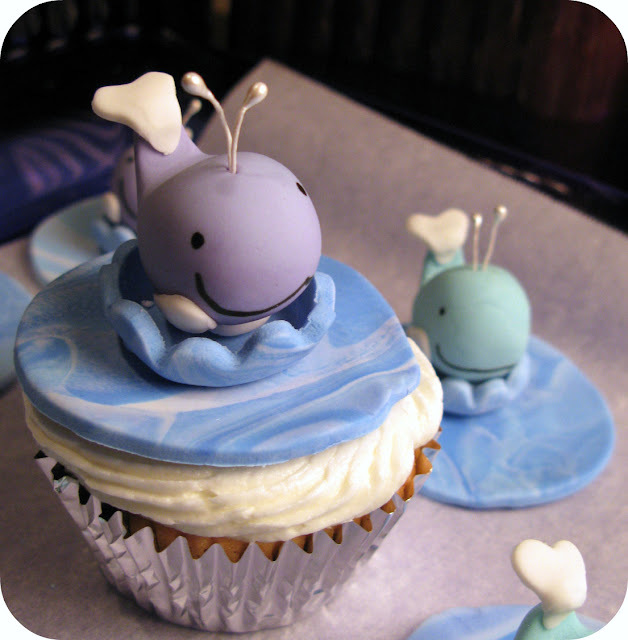 Sara and Alex -- thank you for sending my little whales to Cupcake Takes the Cake! That's so cool of you! Elyse -- I'll be posting the recipe on Sunday. They were a huge hit today and I think you'll love them. Remembering Moments -- nope, this is not my day job, just a hobby! I have never really considered myself very artistic but I think it's within all of us. I just see things in terms of shapes. The whale is just a ball with a tail. The tail is a heart and the flippers are made from a heart that was cut in half. You can do it too, I'm certain! I don't blame you for taking many photos..They are soooo photogenic and cute cute cute! Those are possibly cuter than the pink bug cupcakes you posted a few months ago! These are good photos, in that they convey the cuteness of these whales pretty darned well. I loved the scallop waves, and the watery swirls mixed into the disks on which the whales were mounted were a great touch. The little waterspouts were truly inspired. The strawberry flavor did not fully dominate the cupcake, but was definitely enough to make it clear that this was a strawberry dessert. The cupcakes were plenty moist without sacrificing that great cake consistency. 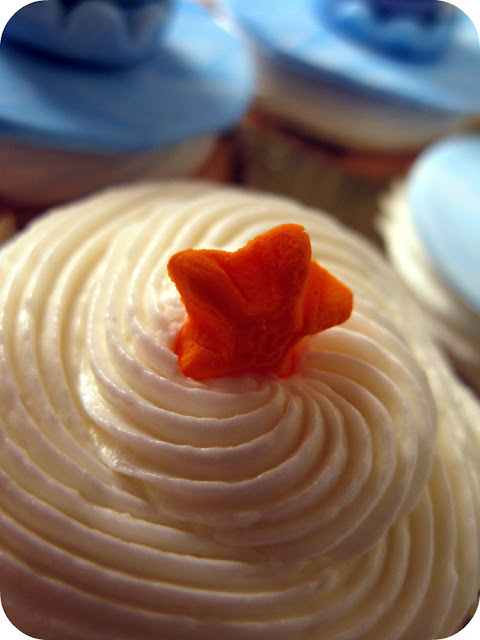 And the frosting was - as always with Julia's cupcakes - a perfect finish. These are the cutest cupcakes ever! Your work is always so flawless and beautiful. I'll have to keep you in mind if I ever have a baby! Precious! I'm so glad StumbleUpon sent me to you! I'll definitely be back! you have done such a great job! Beautiful idea, whales for little boys are so cute. Cant wait to see the recipe too. Oh my goodness, these are darling. I wish I could do that! Oh, ADORABLE! 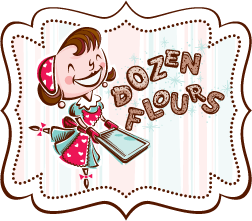 I came across these when I googled for blackberry muffin recipes. ;) What a lovely blog you have. aiyeeee i love these!!!!! 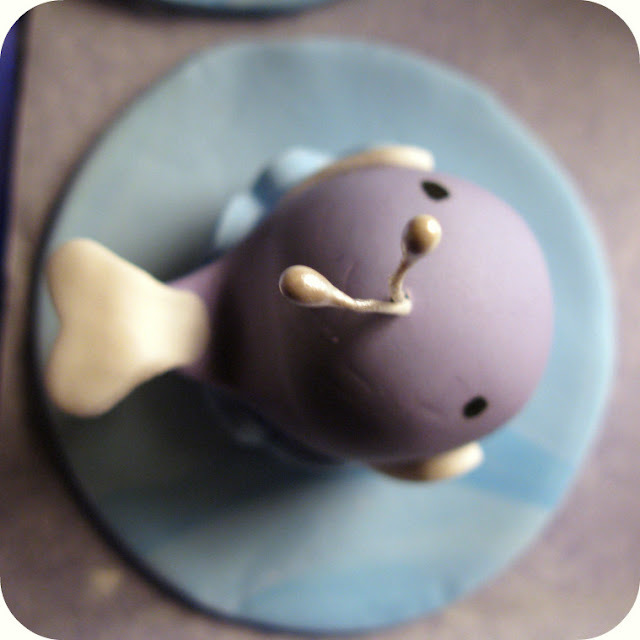 i've been doing some fondant little characters lately too, these whales "take the cake"! These are so cute! You did a great job, to say the least! I was frustrated. Now Im delighted.